FOR determining the amount of rain that will fall during a season, the Temperature Chart for that season must be consulted. But within the season, such rain as does fall will come down during those weeks that show the most wetness in the Moisture Charts. And within the week which shows rain will fall, the precipitation will be most pronounced on those days when planets make heavy aspects to the Ascending degree. And as the Moon rules moisture, the heavy aspects made by the Moon to the degree on the Ascendant of the Moisture Charts in particular are indicative of precipitation. But no matter how wet the Moisture Chart is, unless the Temperature Chart for the season within which it is erected also indicates precipitation, none will be present. Furthermore, the normal amount of precipitation in the given area at the particular time of year for which the Moisture Chart is erected also always must be taken into consideration. Both the Temperature Chart for the season, and the particular Moisture Chart under consideration, only indicate variations from the normal for that season at that definite place. The amount of rainfall, or snowfall, indicated by both charts is not absolute; but the days on which such rainfall or snowfall as does occur, are indicated exclusively by the Moisture Chart without reference to any other chart. They will be the days on which transit progressed planets, as shown by their positions in the ephemeris on the given calendar days, make aspects to the degree on the Ascendant of the Moisture Chart. Fortunately for ease in calculating these Moisture Charts the various ephemerides issued annually give the time when the Moon makes the conjunction with the Sun, the first square to the Sun, the opposition to the Sun, and the last square to the Sun. The time given for each of these four aspects of the Moon to the Sun is the time for which Moisture Charts are erected. The chart erected for each of these aspects is the Moisture Chart covering the next seven days until the next Moisture Chart takes over the influence. 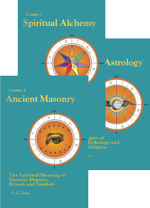 Starting with the New Moon when the Moon is conjunction the Sun, moving the eye down the aspectarian, seven days will bring it to the first square, and so on. But in most ephemerides, the time given for all aspects is Greenwich Mean Time. This is the time for which the positions of all the planets are calculated; for when an aspect between planets is complete, the positions of the planets in the zodiac are the same the world over. But their house position differs with both longitude and latitude. Therefore, the Local Mean Time at the place for which the weather is to be forecasted must be ascertained by subtracting the time difference if the place is West of Greenwich, and adding the time difference if the place is East of Greenwich. The time difference is ascertained by multiplying each ° by four and calling it minutes, and each ′ by four and calling it seconds, and then reducing to hours, minutes and seconds. In the ephemeris for 1932 the aspectarian records that on Jan. 1, the Moon makes the square of the Sun at 1:23 A.M. To erect the Moisture Chart for this last quarter of the Moon it became necessary to subtract the Los Angeles time difference of 7h 53m from the mentioned Greenwich Time. Subtracting 7h 53m 00s from 1932y 1m 1d 1:23 A.M. gives the Local Mean Time at Los Angeles for which to erect the chart as 1931y l2m 31d 5:30 P.M. 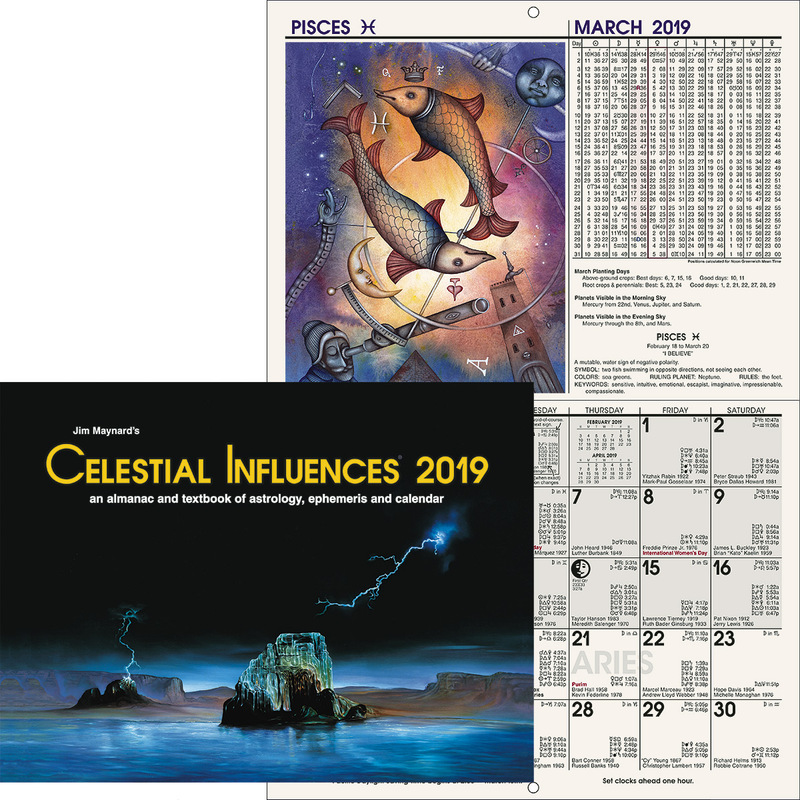 Therefore the sidereal time and house positions are calculated for Dec. 31, 1931, 5:30 P.M., and the planets are calculated as usual for Jan. 1, 1932, 1:23 A.M. EGMT. Had the place for erecting the Moisture Chart been Denver, Colorado, where the time difference is 6h 59m 56s, the Local Mean Time would have been Dec. 31, 1931, 6h 23m 04s P.M. Had the place for erecting the chart been Des Moines, Iowa, with a time difference of 6h 14m 32s, the Local Mean Time would have been Dec. 31, 1931, 7h 8m 28s P.M. Had the place for erecting the chart been Cleveland, Ohio, with a time difference of 5h 26m 52s, the Local Mean Time would have been Dec. 31, 1931, 7h 56m 08s P.M. In each instance the house cusps used would be for the latitude of the place. Using the precise Sidereal Time ascertained from the Local Mean Time and the Sidereal Time given on that day in the ephemeris, and the Table of Houses for the nearest latitude to the place, and making the proper corrections, in each Moisture Chart the precise sign, °, and ′ on the Ascendant should be ascertained; for it is the aspects to this position that determine when there will be precipitation. In handling the relation between the aspects and the moisture precipitation records, for the purpose of indicating the relation between them, and how, therefore, to forecast rain, it will be necessary to proceed in a slightly different manner than we did when handling the Temperature Charts and the Air Movement Charts. On any day of the year, whatever the aspect to the Temperature Chart Ascendant, or without any aspect to it, there is always some temperature that may be recorded. And more often than not, regardless of the aspects to the Ascendant of the Air Movement Chart, there is some air movement to be recorded. But in most places there are more days in the year when no rain falls than days when precipitation may be recorded; and in many localities, such as Los Angeles, there are sections of the year when it is customary for months to pass without a drop of rain. Thus if we are to consider every aspect that forms to the Asc. in such a semiarid region, most of them would coincide with no rainfall. Therefore, in following the records of the Weather Map, we shall here consider only those dates on which at least a trace of moisture fell, and observe the aspect made to the Ascendant on that day. As there are so many Moisture Charts to consider, only their elements are given. These may be found for each Moisture Chart, and may be copied off onto a blank chart for study. This should be supplemented by erecting Moisture Charts in the region where you live, and noting the influence of aspects to the Ascendant on the precipitation of moisture in that area. Unlike the temperature record and the wind record, the precipitation record, resulting from moisture measurement at 5:00 A.M. Pacific Standard Time (8:00 A.M. Eastern Standard Time), records the total amount of rain which has fallen during the preceding 24 hours. It may, or may not, be raining at the time the measurement is made. Therefore, any aspect during the 24 hours preceding the record coincides with the recorded precipitation, rather than the aspects forming on the day the measurement is made unless the aspect was within the one effective degree of orb before the time the measurement was made. It will be my practice, consequently, to state the day on which the aspect was perfect; and then follow this with the rainfall reading following the influence of the aspect. This reading usually will be the one recorded on the day following the one on which the aspect was perfect, on the assumption that the indicated rain did not start until the aspect was complete, although it may have started at any time while the aspect was within its one effective degree of orb. However, we must bear in mind under a wet Moisture Chart, if the chart is wet enough, that a very slight aspect may start precipitation, and that the rain may continue unabated throughout the entire seven days covered by the chart, and if the season is a wet one, and the next Moisture Chart is also wet, it may continue through the whole seven days influenced by it also. For instance, in the Puget Sound region, in winter, it takes a very dry Moisture Chart to prevent it raining most of the week it influences. The Moon is the one really wet planet of them all. And although it moves so rapidly, and by progression has only one-seventh the power of the other planets by similar progression, its aspects to the Ascendant are of prime importance in predicting the days, and the time of day, when rain may be expected. The heavier aspects, especially from watery signs, are more indicative of rain. The conjunction and opposition of the Moon to the Ascendant of the Moisture Chart are most powerful to precipitate moisture, and the parallel, if at the same time some zodiacal aspect is operative, is next most powerful. Then come the square and the trine, followed in power by the sextile. The semisquare and sesquisquare are not quite so powerful as the sextile, and the inconjunct and semisextile are the weakest of all the aspects in power to bring rain. As we will start our examples relative to precipitation with January 1, 1932, our first step is to see what the winter season as a whole indicates. This information we gain from consulting Temperature Chart No. 165, erected for Dec. 22, 1931, at Los Angeles. This chart is given in Serial Lesson 190 (Course XV, Chapter 1). 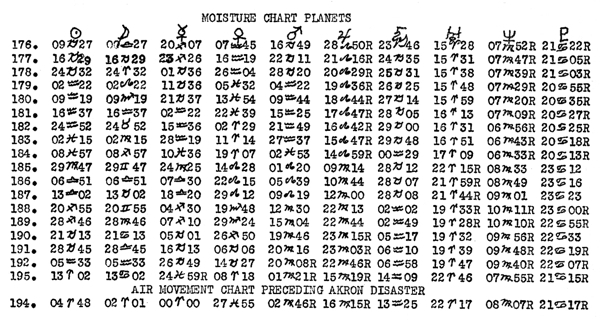 A Temperature chart indicates not merely the temperature and when it will change due to aspects of the planets to the degree on the Ascendant, but in a general way also the amount of wind and the amount of moisture precipitation during the following three months. This chart has dry Gemini on the cusp of the fourth, and its ruler, Mercury, in dry Sagittarius. The accounts for one-half of the influence of the chart. Dry Uranus is in the first house, but the cusp of the first is occupied by wet Pisces. Neptune, ruling the cusp of the first, is in dry Virgo. This accounts for one-fourth of the influence of the chart. Saturn, ruling the sign the Sun is in, is in stormy Capricorn. This accounts for one-eighth of the influence of the chart. Of the planets in angles, all 4, Mercury, Sun, Mars and Uranus, are dry. This accounts for one-eighth of the influence of the chart. We are warranted in concluding, therefore, that the season as a whole would be very dry; and this is borne out by the report in Climatological Data. This chart, erected for the last quarter of the Moon, Dec. 31, 1931, 5:50 P.M. LMT., Los Angeles, governs the first seven days of 1932 in reference to precipitation, subject to the dry influence of season chart No. 165 (Serial Lesson 190, Course XV, Chapter 1). Dry Libra is on the cusp of the fourth, and its ruler, Venus, is in dry Aquarius. This accounts for one-half of the influence of the chart. Moist Pluto is in the first house, and wet Cancer is on the cusp of the first. Its ruler, the Moon, is in dry Libra. This accounts for one-fourth of the influence of the chart. The ruler of the sign Libra, occupied by the Moon, is Venus in the dry sign Aquarius. This accounts for one-eighth of the influence of the chart. Of the planets in angles, Venus and Saturn are wet, and Pluto is damp, while Mars is dry. This accounts for one-eighth of the influence of the chart. We conclude, therefore, that due to the wet planets in angles there will be a little rain, but that most of the week will be dry. Jan. 1, the Moon made the square to the Asc., and this was followed by .29 inches of rain during the next 24 hours. There was no other rain in Los Angeles during the week. This chart, erected for the New Moon on Jan. 7, 1932, 3:36 P.M. LMT., Los Angeles, also shows very little rain for the following week. Dry Virgo is on the cusp of the fourth, and its ruler, Mercury, is in dry Sagittarius. This accounts for one-half of the influence of the chart. Dry Gemini is on the cusp of the first, and its ruler, Mercury, is in dry Sagittarius. This accounts for one-fourth of the influence of the chart. Saturn, the ruler of the sign the Moon is in, is in wet Capricorn. This accounts for one-eighth of the influence of the chart. Of the planets in angles, both the Sun and Mars are dry. This accounts for one-eighth of the influence of the chart. We conclude from these indications that the week following this New Moon will be even dryer than the preceding week, but that there will be some moisture. On Jan. 12, when Mercury came opposition the Asc., there was a precipitation of .15 inches, and the following day, when the Moon made the square to the Asc., there was a precipitation of .04 inches. This chart, erected for the first quarter of the Moon, Jan. 15, 1932, 1:52 P.M. LMT., Los Angeles, is wet enough to cause considerable precipitation if the season chart showed wetness. Dry Jupiter is in the fourth. Dry Leo is on the cusp of the fourth, and its ruler, the Sun, is in wet Capricorn. This accounts for one-half of the influence of the chart. Wet Taurus is on the cusp of the first, and its ruler, Venus, is in dry Aquarius. This accounts for one-fourth of the influence of the chart. Mars, ruling the sign occupied by the Moon, is in wet Capricorn. This accounts for one-eighth of the influence of the chart. Of the two planets in angles, Jupiter is dry and Venus is wet. This accounts for one-eighth of the influence of the chart. At the time of erection of the chart, the Sun was already 2′ within, and applying to the trine of the Asc., and the only rain that fell was under this aspect, .01 inches being recorded on Jan. 15, and .44 inches the following morning. Saturn was also trine the Asc. during the duration of the chart. This chart, erected for Full Moon, January 23, 1932, 5:51 A.M. LMT., Los Angeles, if the season had been normal would have indicated considerable precipitation. Wet Taurus is on the cusp of the fourth, and its ruler, Venus, is in wet Pisces. This accounts for one-half of the influence of the chart. Of the three planets in the first, Saturn is wet, but both Mars and the Sun are dry. Mercury, almost in precise conjunction with the Asc., is also dry. Saturn, ruler of the Asc., is in the wet sign Capricorn. This accounts for one-fourth of the influence of the chart. The Sun, ruling the sign occupied by the Moon, is in dry Aquarius. This accounts for one-eighth of the influence of the chart. Of the planets in angles, Moon, Saturn and Pluto favor rain; but Mars, Jupiter and the Sun are dry. This accounts for one-eighth of the influence of the chart. In this dry season the only rain that fell during the week was .01 of an inch, which fell Jan. 27 while Venus was within the effective one degree of sextile Asc. This chart, erected for the second square of Moon to the Sun Jan. 30, 1932, 1:42 A.M. LMT., Los Angeles, is a much different chart than the four already considered. Wet Venus is in the fourth house. Wet Pisces is on the cusp of the fourth, but its ruler, Neptune, is in dry Virgo. This accounts for one-half of the influence of the chart. The wet sign Scorpio is on the cusp of the first, its ruler, Mars, is in the dry sign Aquarius, and its coruler, Pluto, is in the wet sign Cancer. This accounts for one-fourth of the influence of the chart. Mars, the ruler of the sign occupied by the Moon, is in the dry sign Aquarius. This accounts for one-eighth of the influence of the chart. The two planets in angles, Venus and Neptune, both tend toward moisture. This accounts for one-eighth of the influence of the chart. From such a chart as this, dominated by a normal Temperature Chart, quite heavy rains might be expected. Within 24 hours after the commencement of the influence of the chart Mercury came to the sextile of Asc., and at 5:00 A.M. of Jan. 30, as the chart came in there was a trace of rain recorded; and the next day, with Mercury making the sextile Asc., there was no record, as the day was Sunday. But during the day following the perfect aspect the record shows that 1.95 inches of rain fell. Feb. 2, with Mars parallel Asc., and Moon semi sextile Asc., .53 inches were recorded. Feb. 3, with Moon semisquare the Asc., the precipitation fell off to .02 inches. The only other moisture recorded during the week was a trace which fell on the 5th, following the sextile of Moon to Asc. This chart, erected for New Moon on Feb. 6, 6:53 A.M. LMT., Los Angeles, is still a different type of influence. While otherwise dryer, Mars being within progressed conjunction the Asc., and Uranus being within progressed sextile to the Asc., give the chart unusual activity, and indicate almost as much precipitation as was indicated in Chart No. 180. Dry Gemini is on the cusp of the fourth, and its ruler, Mercury, is in dry Aquarius. This accounts for one-half of the influence of the chart. Dry Mars and dry Sun are in the first, but the wet Moon is also there. Uranus, the ruler of the first, is in dry Aries. This accounts for one-fourth of the influence of the chart. Uranus, ruling the sign occupied by the Moon, is in dry Aries. This accounts for one-eighth of the influence of the chart. Of the six planets in angles, Sun, Mars and Jupiter are dry, while Moon, Venus and Neptune tend toward moisture. This accounts for one-eighth of the influence of the chart. However, as previously indicated, the Asc. is given unusual activity by progressed aspects of Mars and Uranus to it. Heavy aspects to the Asc. of any weather chart, especially if within the one degree of effective progressed orb, tend toward storms. This is such a chart. 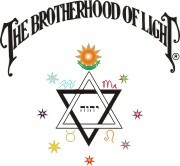 On the day the chart commenced, under the influence of the two progressed aspects to the Asc. a trace of rain was recorded. Feb. 6, Mars came to the perfect conjunction the Asc., but as it was Sunday there is no record. Feb. 8, Mars had moved beyond the conjunction with the Asc. but was parallel the Asc., and the record shows .64 inches of rain, and on the 9th, under this parallel aspect, there was 1.52 inches. Feb. 10, when the parallel aspect was perfect, and the Moon came semisquare the Asc., .40 inches of rain was recorded. Feb. 13, the Moon came parallel and square the Asc., and a trace of moisture shows on the records. This chart, erected for the first square of the Moon on Feb. 14, 1932, 10:21 A.M. LMT., Los Angeles, also indicates some rain, but not because of heavy aspects to the Asc. Dry Jupiter is in the fourth house, but wet Cancer is on its cusp, and its ruler, the Moon, is in wet Taurus. This accounts for one-half of the influence of the chart. The wet Moon is in the first, and wet Taurus on the cusp of the first, while its ruler, Venus, is in dry Aries. This accounts for one-fourth of the influence of the chart. Venus, ruling the sign occupied by the Moon, is in dry Aries. This accounts for one-eighth of the influence of the chart. Of the planets in angles, Mars, Mercury and Jupiter are dry, while Saturn and the Moon are wet. This accounts for one-eighth of the influence of the chart. 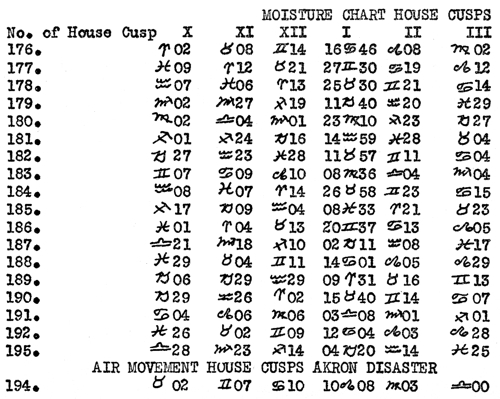 As the Moon was in the first house and Mars was parallel the Asc., .32 inches of moisture fell during the hours following the erection of the chart. Feb. 16, following the semisextile of the Moon to the Asc., .51 inches were recorded. Feb. 17, the Moon made the semisquare to the Asc. and slightly more moisture, .74 inches, fell. The semisquare is both a little more powerful, and a little more violent than the semisextile. Feb. 18, only a trace was recorded, but as the Moon made the sextile to the Asc. from the wet sign Cancer, this aspect recorded .23 inches on the 19th, during the hours following the aspect. This completed the moisture precipitation for the week. This chart, erected for the opposition of the Moon to the Sun on Feb. 21, 1932, 6:15 P.M. LMT., Los Angeles, indicates dry weather. Dry Sagittarius is on the fourth, and its ruler, Jupiter, is in dry Leo. This accounts for one-half of the influence of the chart. Dry Virgo is on the cusp of the first, and Mercury, its ruler, is in dry Aquarius. This accounts for one-fourth of the influence of the chart. Mercury, ruling the sign occupied by the Moon, is in dry Aquarius. This accounts for one-eighth of the influence of the chart. No planets in angles accounts for one-eighth of the influence of the chart. As might have been expected, no rain fell during the week following the date on which this chart started its influence. This chart was erected for the last quarter of the Moon, Feb. 28, 1932, 10:14 A.M. LMT., Los Angeles. It also is a quite dry chart. Dry Jupiter is in the fourth, and dry Leo on its cusp. 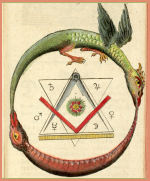 The ruler of the cusp of the fourth, the Sun, is in the wet sign Pisces. This accounts for one-half of the influence of the chart. Wet Taurus is on the cusp of the first, and Venus, its ruler, is in dry Aries. This accounts for one-fourth of the influence of the chart. Jupiter, the ruler of the sign occupied by the Moon, is in dry Leo. This accounts for one-eighth of the influence of the chart. Of the four planets in angles, Neptune is foggy, the Moon is wet, and Jupiter and Mars are both dry. This accounts for one-eighth of the influence of the chart. No rain fell during this week. The dry influence of the Temperature Chart had become so pronounced that no more rain fell during the season. Because the summer half of the year in Los Angeles has so few rainy days, and 1932 was a dryer year than usual, to proceed with example charts that show at least a little precipitation, we will skip both the spring season and the summer season, and continue our examples starting with the autumn, first considering the Temperature Chart for this season. This chart (Serial Lesson 192, Course XV, Chapter 3) was erected for September 22, 1932, 10:23 P.M. LMT., Los Angeles. Of the four planets in the fourth, Sun, Mercury and Jupiter are dry, and Neptune is moist. Dry Virgo is on the cusp of the fourth, and Mercury, its ruler, is in the dry sign Virgo. This accounts for one-half of the influence of the chart. The wet Moon is in the first, but dry Gemini is on the cusp of the first, and its ruler, Mercury, is in dry Virgo. This accounts for one-fourth of the influence of the chart. Venus, ruling the sign the Sun occupies, is in dry Leo. This accounts for one-eighth of the influence of the chart. Of the five planets in angles, Moon is wet, Neptune is damp, and the Sun, Mercury and Jupiter are dry. On the whole, while the Moon?s influence indicates some rain for the season, the chart is pronouncedly dry. And Climatological Data records that the precipitation for each of the three months it covered was decidedly subnormal. This chart was erected for the last quarter of the Moon, Sept. 22, 4:53 P.M. LMT., Los Angeles. The wet Moon is in the fourth. Dry Gemini is on the cusp of the fourth, and its ruler, Mercury, is in dry Virgo. This accounts for one-half of the influence of the chart. Wet Pisces is on the cusp of the first, and its ruler, Neptune, is in dry Virgo. This accounts for one-fourth of the influence of the chart. Mercury, ruling the sign occupied by the Moon, is in dry Virgo. This accounts for one-eighth of the influence of the chart. Of the planets in angles, the Moon is wet, Neptune is moist, and Sun and Jupiter are dry. However, Neptune is precisely opposition the Asc., and Jupiter is within the one effective degree of opposition the Asc. Such heavy aspects from slow moving planets tend to indicate storms. Yet because it takes a wet season chart together with a real wet Moisture Chart to give rain in September in Los Angeles, none was experienced there. Rain in Los Angeles in September is unusual. But the moisture indications, and also the storm indications shown by Jupiter and Neptune, within progressed opposition of the Asc. were fully borne out in the mountains surrounding Los Angeles. In Los Angeles the influence of the Neptune aspect only brought much fog. This chart was erected for the New Moon, Sept. 29, 1932, 9:37 P.M. LMT., Los Angeles. It is not particularly a wet chart, but is decidedly a storm chart. Moist Neptune and dry Jupiter are in the fourth. Dry Virgo is on the cusp of the fourth, and its ruler, Mercury, is in dry Libra. This accounts for one-half of the influence of the chart. Dry Gemini is on the cusp of the first, and its ruler, Mercury, is in dry Libra. This accounts for one-fourth of the influence of the chart. Venus, ruler of the sign occupied by the Moon, is in dry Leo. This accounts for one-eighth of the influence of the chart. Of the planets in angles, Jupiter is dry and Neptune is moist. This accounts for one-eighth of the influence of the chart. When violent planets make heavy aspects, especially afflictions, there is a tendency toward destructive storms; and these storms, thus shown by the zodiacal aspects of the planets, tend to take place in those regions where the Ascendant is also severely afflicted in the weather charts. In this chart there is a T-square formed by Saturn opposition Pluto, and Uranus making the square to both. Uranus, one member of this T-square, is within 1° 22′ of perfect sextile to the Asc., violent Mars makes the progressed semisquare to the Asc. within 2′ of perfect, and Neptune conjunction Jupiter in the fourth and in progressed semisquare aspect with Pluto, all tend toward violent weather. And because one of the violent influences—Mars—is in progressed aspect to the Asc., one might be sure that the violence would not long be delayed. Under the aspect of Mars to the Asc., in Los Angeles .02 inches of rain was recorded on the day the chart commenced its influence, .10 inches fell on the next day, the 30th, and .02 on Oct. 1. All the rain that fell was precipitated while Mars was still semisquare the Asc. For Los Angeles this was about what might have been expected with Neptune in the fourth, and so dry a chart. It was not much more than a heavy fog. But about 100 miles north of Los Angeles, in practically the same Longitude, but the higher latitude bringing the Asc. to a position where Uranus was just within the one effective degree of sextile to it, there was a cloudburst. This was in the Tehachapi Mountains. And it was only there that the full violence of the chart was manifested. This chart was erected for the first square of the Moon, Oct. 6,1932,12:16 P.M. LMT. Los Angeles. Dry Uranus is in the fourth, and dry Aries on the cusp of the fourth. Mars, the ruler of the cusp of the fourth, is in dry Leo. Thus this one-half of the chart is completely dry. Wet and stormy Saturn is in the first, and wet Capricorn is on the cusp of the first. Saturn, ruler of the cusp of the first is in wet Capricorn. In a normal season, in spite of the dry fourth, this one-fourth of the chart being all wet would indicate some rain, especially as the wet Moon is also in the first. Saturn, ruling the sign occupied by the Moon, is wet. This accounts for one-eighth of the influence of the chart. Of the planets in angles, Moon, Saturn and Pluto are wet, but Uranus is dry. This accounts for one-eighth of the influence of the chart. In a wet season, in spite of the complete dryness of the fourth house, we would have expected considerable rain. But as the season as a whole was so dry, only a little moisture could be looked for. Here again the heavy afflictions among the planets indicated storm; but as none of the violent planets were closely in aspect with the Asc., and as there was no progressed aspect within the one effective degree of orb to the Asc., it was unlikely the indicated storm would occur within the area covered by this chart. Oct. 9, Venus made the trine to the Asc., and before the next morning .06 inches of rain had fallen. Because the season as a whole was so dry, there is no point in giving the charts of the weeks that followed up to the one for December 12. This chart was erected for the Full Moon of Dec. 12, 1932, 6:29 P.M. LMT., Los Angeles. Here again we find a chart showing violence, although in this one no zodiacal aspect is within the one effective degree of orb to the Asc., but both Pluto and the Sun are parallel the Asc. Both Pluto and Uranus are in angles, square to each other, and Saturn also in an angle opposition Pluto. The parallel of Pluto to the Asc. lasts throughout the duration of the chart and connects up the violent influences with the region for which the chart was erected. Therefore it could logically be assumed that the stormy condition indicated by the afflictions in the sky would be felt in the region for which this chart was erected. Dry Uranus is in the fourth. Dry Virgo is on the cusp of the fourth, and its ruler, Mercury, is in dry Sagittarius. This one-half of the influence of the chart, except for the aspect of Uranus to moist Pluto, indicated dry weather. Moist Pluto is in the first, opposition wet Saturn and square dry Uranus. Wet Cancer is on the cusp of the first, and the Moon, its ruler, is in dry Gemini. Here the one-fourth influence of the chart is decidedly wet. Mercury, the ruler of the sign occupied by the Moon, is in dry Sagittarius. This accounts for one-eighth of the influence of the chart. Of the planets in angles, Pluto is moist, Saturn is wet, and Uranus is dry. All three are violent. This accounts for one-eighth of the influence of the chart. Dec. 13, The Sun was parallel the Asc., and the record is .37 inches of rain. Dec. 14, Mars came sextile the Asc., and there is recorded .09 inches of rain. Dec. 15, Mars was still sextile the Asc., and there is recorded .03 inches of rain. And so far as Los Angeles itself was concerned that finished the storm and the precipitation for the week. As the next moisture chart goes into the winter season, let us look at it for indications of rain during the winter months of 1933. This chart (Serial Lesson 192, Course XV, Chapter 3) was erected for December 22, 1932, 5:21 P.M. LMT., Los Angeles. The wet Moon and dry Jupiter are in the fourth house. Dry Virgo is on the cusp of the fourth, and its ruler, Mercury, is in dry Sagittarius. This accounts for one-half of the influence of the chart. Moist Pluto is in the first house, and the wet sign Cancer on the cusp of the first. The Moon, ruler of the cusp of the first, is in the dry sign Libra. This accounts for one-fourth of the influence of the chart. Saturn, ruling the sign occupied by the Sun, is in dry Aquarius. This accounts for one-eighth of the influence of the chart. Of the four planets in angles, Pluto is moist and the Moon is wet, but Jupiter and Uranus are dry. This accounts for one-eighth of the influence of the chart. On the whole, the indications of the chart are that there would be as much, or more, than the average amount of rainfall for the season. This was borne out by Climatalogical Data. But the peculiar thing about the weather was that almost the total rainfall for the season fell between the 15th and 3lst of January. Therefore, let us consider the first Moisture Chart of the season, and then the three charts covering the period in which the precipitation was so heavy. 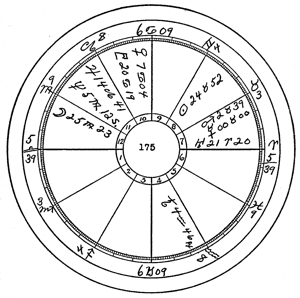 This chart was erected for the last quarter of the Moon, December 20, 12:28 P.M. LMT., Los Angeles. It covers the first five days of the winter season, and thus during those days is subject to the winter season Chart No. 169 (Serial Lesson 192, Course XV, Chapter 3). Moist Pluto is in the fourth house, and wet Cancer is on the cusp of the fourth. The Moon, ruler of the cusp of the fourth, is in dry Sagittarius. This accounts for one-half of the influence of the chart. Dry Uranus is in the first house, and dry Aries on the cusp of the first. Its ruler, Mars, is in dry Virgo. This one-fourth of the influence of the chart is dry. Mercury, ruling the sign occupied by the Moon, is in dry Sagittarius. This accounts for one-eighth of the influence of the chart. Of the two planets in angles, Uranus is dry and Pluto is moist. This accounts for one-eighth of the influence of the chart. Under such a chart, as the season promises rain, some moisture may be expected. However, such rain as did fall right in the Los Angeles area fell immediately following the start of the influence of the chart, and before the winter season commenced. It was only a trace, and was due to Neptune being within the one effective degree of orb of inconjunct the Asc. Now let us skip the New Moon of December 27, 1932, and the first square of the Moon on January 3, 1933, as both of these Moisture Charts are exceedingly dry, and other than indicating dryness have no points of interest. This chart was erected for Full Moon January 11, 1933, 12:43 P.M. LMT., Los Angeles. Wet Cancer is on the cusp of the fourth house, and its ruler, the Moon, is in dry Virgo. This accounts for one-half of the influence of the chart. Wet Taurus is on the cusp of the first house, and its ruler, Venus, is in dry Sagittarius. This accounts for one-fourth of the influence of the chart. The Moon, ruling the sign occupied by the Moon, is wet. This accounts for one-eighth of the influence of the chart. The only planet in an angle is wet Saturn. This accounts for one-eighth of the influence of the chart. Thus here we have quite a wet Moisture Chart. Jan. 15, the Moon made the trine of the Asc., and the following morning the record was .08 inches of rain. This was the commencement of a rainstorm which lasted until Jan. 31. Jan. 17, as Mercury moved up to trine Asc., the record showed 2.68 inches of rain. This chart was erected for the last quarter of the Moon, Jan. 18, 1933, 10:22 P.M. LMT., Los Angeles. Sun and Mercury in the fourth house are dry, but Venus also in that house is wet. Capricorn, on the cusp of the fourth is wet, and its ruler, Saturn, is in dry Aquarius. This accounts for one-half of the influence of the chart. Wet Moon is in the first house, and the cusp of the first is occupied by dry Libra. Capricorn, occupied by Venus, ruling the cusp of the first, is wet. This accounts for one-fourth of the influence of the chart. Of the planets in angles, the Moon and Venus are wet, and Uranus, Sun and Mercury are dry. This accounts for one-eighth of the influence of the chart. Jan. 19, the Moon made the semisextile of the Asc., and there was recorded .73 inches of rain. Jan. 20, with the Moon semisquare the Asc. in this wet chart, the record was 2.31 inches of rain. Jan. 21, under the milder aspect, Moon sextile Asc., the rainfall dropped off to .23 of an inch. Curtailment of funds by the Government made records unavailable until Jan. 24. Jan. 24, the Sun was trine Asc., almost out of orb of influence, and the record was .52 inches. But the newspapers indicate that on the two previous days while the Sun was trine the Asc. there was also considerable rain. This chart was erected for New Moon, January 25, 1933, 3:27 P.M. LMT., Los Angeles. Dry Virgo is on the cusp of the fourth house, and its ruler, Mercury, is in wet Capricorn. This accounts for one-half of the influence of the chart. Damp Pluto is in the first and wet Cancer on the cusp of the first. Moon, ruler of the cusp of the first is in dry Aquarius. This accounts for one-fourth of the influence of the chart. Of the planets in angles, Pluto is damp and Venus is wet, while Uranus and Mercury are dry. This accounts for one-eighth of the influence of the chart. Jan. 25, no rain fell. Jan. 26, the Moon made the inconjunct with the Asc., and there was recorded .21 inches of rain. Jan. 28, the Moon made the trine to the Asc. and there was .08 inches of rain. Jan. 30, the Moon made the square of the Asc. and under this more violent aspect 1.48 inches of rain was recorded. This finished the storm, and also practically all the rainfall for the three month season. This chart was erected for the first quarter of the Moon, April 3,1933, 1:00 A.M., LMT., 74 W., 39:45N., off Barnegat Light, N.J.
Dry Aries is on the cusp of the fourth, and its ruler, Mars, is in dry Virgo conjunction Neptune. This accounts for one-half of the influence of the chart. Wet Capricorn is on the cusp of the first house, and its ruler, Saturn, is in dry Aquarius. This accounts for one-fourth of the influence of the chart. The Moon, ruler of the sign occupied by the Moon, is in wet Cancer. This accounts for one-eighth of the influence of the chart. Of the two planets in angles, Pluto is moist and the Moon is wet. This accounts for one-eighth of the influence of the chart. The significant thing about this chart is not the amount of precipitation, which would be about average for the season in New Jersey, but the conjunction of Sun with electrical and violent Uranus, and the square of both to violent Pluto and the Moon in an angle. When storms are indicated, all three weather charts should be consulted both as to wind and moisture and other conditions. Mars, ruler of the cusp of the fourth is in windy Virgo, and windy Aries is on the cusp of the fourth. Stormy Capricorn is on the cusp of the first, and its ruler is in the electrical sign Aquarius. 2:53 P.M. LMT; 118:15W. 34N. Windy Capricorn is on the cusp of the fourth, and its ruler, Saturn, is in breezy Aquarius, square windy Mercury. Windy Libra is on the cusp of the first, and its ruler, Venus, is in calm Cancer. Venus, ruler of the sign occupied by Mercury, is in calm Cancer. Of the planets in angles, Venus moderates, but Pluto, Mars, Uranus and Saturn are windy.